An attractive mini roller shutter for smaller and specialist openings. The Rollersafe uses a strong compact double sided extruded profile that gives it added strength and durability. 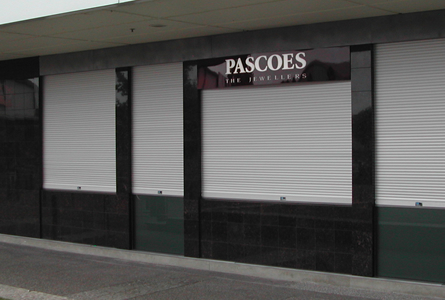 The Rollersafe Aluminium Roller Shutter is ideal for kiosks, cabinets and over windows. The Rollersafe uses a 70mm barrel enabling a small overall roll size that requires a lot less room than standard shutters. The rollersafe can be manually operated using spring balanced torsion springs, motorised or used as a Tambour door. It can also be reverse rolled using our new reversible bottom/locking bar. Extruded aluminium double wall interlocking door slats fitted with nylon end-locks to control lateral movement and reduce noise and friction. Compact 40mm wide double wall slat provides added strength. Extruded Aluminium Section incorporating a mohair brush strip underneath to prevent damaging the floor or counter top surfaces. Bottom rail is designed to retract flush with ceiling or lintel when door is opened. Our Bottom Rail can be reversed to allow for reverse mounted doors. Extruded Aluminium channel 20mm wide x 50mm deep, fixed conventionally behind door jambs or recessed into wall. Flared at top for smooth entry at screen. 70mm diameter door drum for minimal overall roll size and situations where headroom is limited. Torsion springs calculated to balance screen weight for lightweight operation. Several options available in single phase models. Additional clearances required, refer to separate data sheets. Optional extras include UPS Battery Backup (single phase), External Keyswitch & Remote Control. Satin Silver Anodised Aluminium. Powder coating of a wide range of colours available as an optional extra. Maximum recommended size for manual doors is 1500mm wide x 1200mm high. Contact us for recommendations over this size. Interested in ROLLERSAFE Aluminium Roller Shutters?